Get married in Verona "The City of Eternal Love ". Dream Academy Verona's Leading Wedding Planner. Verona - The World’s most famous city for Love and Romance, unique setting for Shakespeare’s Romeo & Juliet and one of Italy’s most captivating and highly sought after locations for an Italian Destination Wedding. Romeo and Juliet's balcony in Verona has been a UNESCO World Heritage Site since 2002 and this special place will fill your eyes and your hearts with wonder at the cultural heritage and wealth of artistic treasures within it’s historic walls. 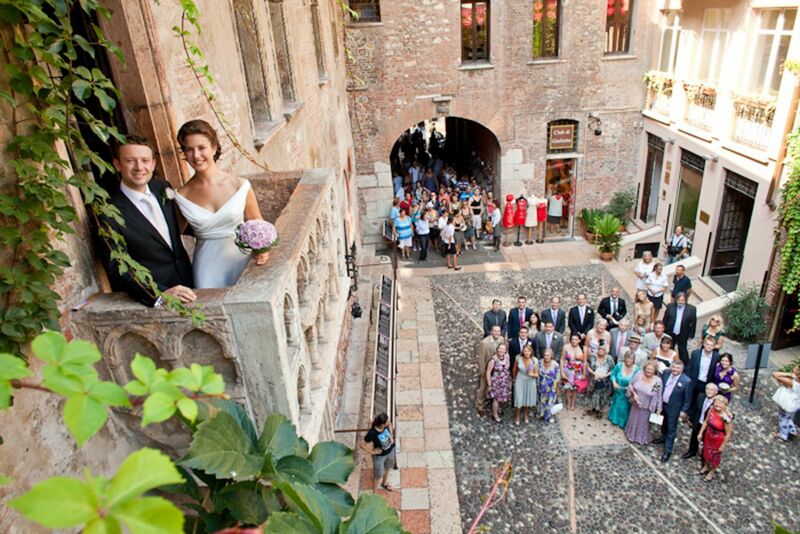 Dream Academy is the leading Wedding Planner in Verona and we are proud to have held the very first civil ceremony at Juliet's Balcony on the 1st of June 2009 in front of the world's press. Verona lives inside a beautiful dream which floats delicately through its ancient piazzas and shady lanes. We have a vast range of locations for your civil ceremony in Verona ranging from the famous balcony to historical villas and palaces. With its magical and romantic atmosphere, Verona performs day after day its role as the City of Love and we look forward to welcoming within its walls, the most beautiful love story of all -----Yours ! 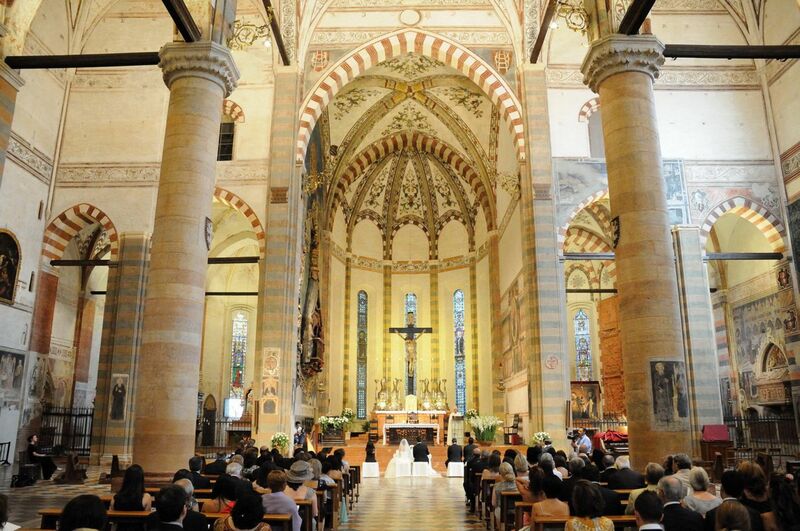 Verona also has many beautiful churches should you wish to have a Catholic Wedding in Verona. We also have an Englsih speaking priest who is happy to celebrate your marriage ceremony here. Verona is the second largest and most important city in the Veneto Region and the Roman influence is still very much in evidence today. The famous Arena di Verona, one of the world’s best preserved roman amphitheatres and where every Summer the World Famous Opera Season takes place. Just picture inviting your guests to have dinner in Verona followed by a night at the opera the evening before your wedding? Many of the musicians we use for our civil and religious wedding ceremonies in Verona are members of this famous orchestra and chorus. Castelvecchio spanning the River Adige and so romantic with the evening lights sparkling in the waters below. The elegance of Piazza Dei Signori with its dramatic Scala della Regione is a stunning location for album shots. Piazza delle Erbe with its street cafes and restaurants, is a great place to people watch. Castel San Pietro, perched on the hill proudly looks down on the city and is a great spot to share time alone enjoying views of the place where you became Man and Wife. Elegant shops and some of the best known names in the fashion industry are to be found here. Gucci, Prada, D&G, Louis Vuitton, Tods---they are all here in the wonderful boutiques lining the main shopping areas. So all you Romeos out there if you loose your Juliets in Verona you will know just where to find them. It’s a paradise for shopping lovers!! Verona is also famous for some of Italy’s best food and quality wines and also the famous Aperol Spritz so you can easily pass the time while Juliet goes shopping ! If all that isn't enough, then add the stunningly beautiful and tranquil setting of the Valpolicella region which is right on our doorstep. Gently rolling hills, hilltop villages, rows of cypress trees, olive groves, fruit orchards and vineyards producing the famous Valpolicella, Recioto and Amarone wines. 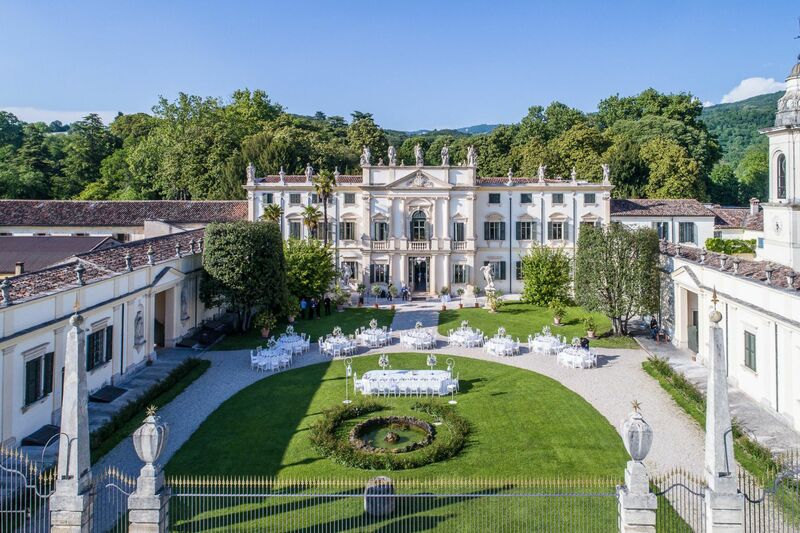 Combine a wedding in Verona with your reception in one of our many historical villas in the Valpolicella area just a stone's throw from the centre of Verona, combining the city with the green countryside. Dream Academy has an office base right at the heart of this amazing area. Still not enough? The sparkling blue waters of Lake Garda and the towering peaks of the Dolomites are only a stone’s throw away. “Can one city really have so much to offer?”. When I realise that the answer to all of those questions is yes, then I thank my lucky stars that I am fortunate to live and work in such an amazing place and I can’t wait to share it all with you. Verona is a city where love hangs heavily in the air and where the locals have a joy for life which they will transmit to you in the friendly, courteous and genuine manner for which they are so well renowned. We will make you feel that you have not just come as a visitor but that you have come into our home and have become part of our family. We are honoured when you choose Verona as the setting for your wedding day, and will put our hearts into making sure that it is a day you will remember and cherish forever. Say "I Dol" in Verona with Dream Academy. Verona's Leading Destination Wedding Planner in Italy. 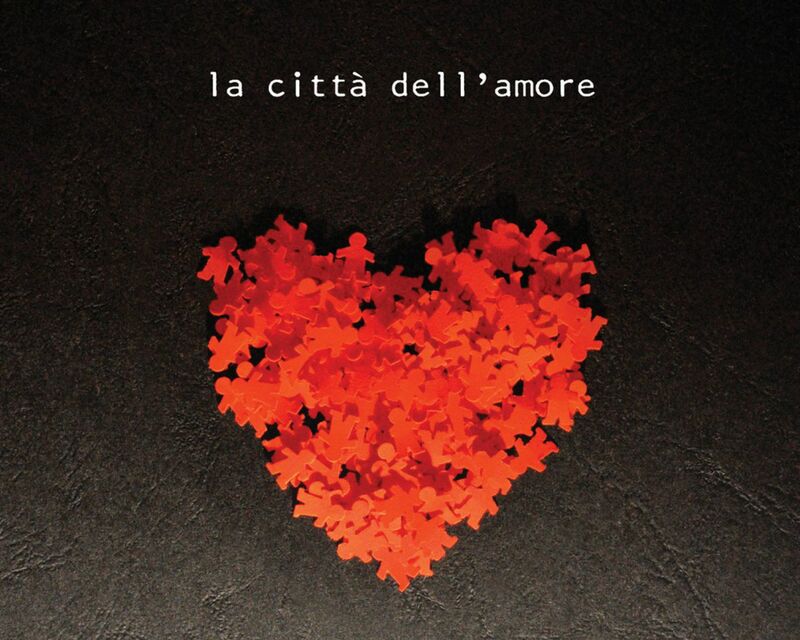 Verona, a city where real love stories are told and known for good reasons as Città dell'Amore ! Weddings in Verona by Dream Academy = Elegance, Romance & Stunning Beauty. THAT'S AMORE !